A new Droid Incredible update appears to be ready and should fix a bunch of little bugs that have plagued users since moving to Android 2.2. There is also a fix for Flash 10.1 which looks like it will take care of the issue mentioned in Adobe’s latest security advisory. Full list after the break, or you could just click on the image above. + Updated Flash® player includes security enhancements. + Visual Voice Mail Wi-Fi improvements include removal of incorrect service messages and post-call notifications. + Enhanced support for Yahoo!® IMAP email. + Attach files larger than 5 MB. + Updated COX POP3 email settings. + Play YouTube videos in YouTube application. + Updated Comcast POP3 email settings. + Search key and other buttons displayed in correct order. + Preinstalled V CAST Apps lets users purchase applications directly from their devices and bill them to a Verizon Wireless account. So nothing major in there, but your phone should love you much more afterwards. 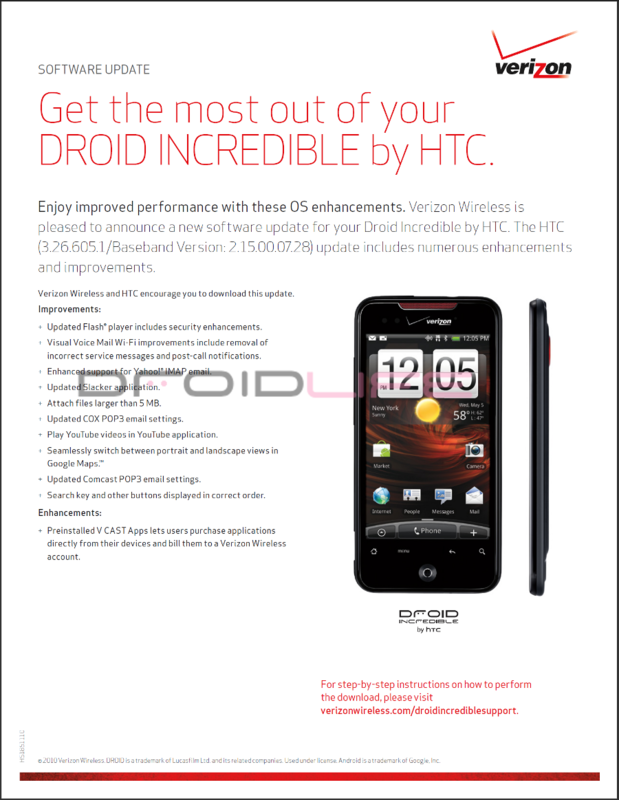 DROID Pro Pre-sale Starts November 9th, in Stores 18th?